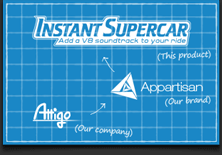 Instant Supercar™ - Supercharge your commute! Instant Supercar™ is a fun iPhone™ app that adds a supercar soundtrack to your vehicle. Using the latest in motion sensing technology, Instant Supercar plays real supercar sounds synced with your journey making your clinky econobox sound like a roaring muscle car. A ride she'll remember...a price you can't beat! $1,699,698.01 cheaper than the competition! Appartisan's crack staff of audio engineers spent countless hours wiring supercars with advanced microphones and driving around really fast all so you could impress your girlfriend. It was awesome. Exotic supercars promise a good time. But they're horrible value for money and terribly inconvenient. Take a look at how Instant Supercar stacks up against the competition. Unlike real supercars that need to be shipped long distances in crates, Instant Supercar™ parks in your iPhone and conveniently fits in your pocket or carry-on luggage. A simple touch brings your Instant Supercar™ roaring to life! Select from one of several models of high-end cars. Engine sounds, valve sounds, exhaust rumble are 100% real, recorded by our crack audio team using our own proprietary methodology and state of the art technology. Start your engine & go! Place your iPhone, iPod Touch or iPad on a flat surface where it won't move, touch the "start your engine" button and go! Enjoy the rumble and roar your Instant Supercar™ adds to your ride. We are a couple of petrol heads that went into business together. C.S. drives a stick shift car around New York recording supercars while Larry has 3 driver's licenses but no car, instead commuting to work on his feet in South China. We've watched every episode of Top Gear more times than you'll ever get us to admit. 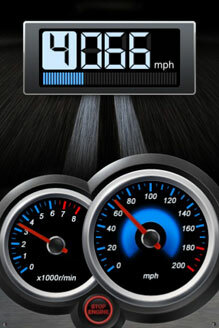 Instant Supercar™ is the first in the Appartisan™ line of mobile applications. Appartisan™ brand applications are developed and sold by Appartisan Limited. Aston Martin V8 Vantage, Audi S5, BMW M6, BMW M3, Corvette Z06, Mercedes-Benz SL55, Nissan GT-R, Porsche 996 Turbo. Report it on Pay4Bugs Software Testing Marketplace and earn cash. Without the support and inspiration of the following people, Instant Supercar would not have been possible.